Applying a mild extract of natural eucalyptus to the scalp has been shown to improve the luster, appearance, elasticity, manageability and bounce of hair. 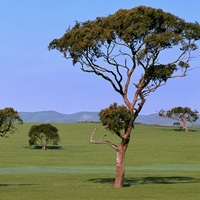 Eucalyptus extract is made from the leaves of the eucalyptus tree, native to Australia. Eucalyptus has a camphor-like scent and is known as a disinfectant, purifier and cleanser, toner and astringent. How does eucalyptus extract improve hair health? A scientific study was conducted with ten healthy subjects. The study participants applied a lotion to half of their scalp that contained a 3% eucalyptus extract. On the other half of the scalp, they applied a lotion that was identical except it contained no eucalyptus. Before the study started, anagen hairs were taken from both sides of the scalp. After the three-week study, hairs were plucked again. The scientists analyzed the transcriptional profiles of the hair root cells using DNA microarray hybridization and quantitative RT-PCR. The study also looked at human cultured keratinocytes and dermal papilla cells to discover the possible genes responsible for improving hair properties. In the hair root cells that were treated with Eucalyptus extract, genes related to the structural components of the hair (i.e., filaggrin, epiplakin1, desmoplakin, S100A8) were down-regulated (meaning that they were not expressed as well). On the other hand, VEGF (Vascular Endothelial Growth Factor, which indicates that new blood vessels are growing) and KRTAP4-12 (a keratin-associated protein) genes were up-regulated (expressed). In the human cultured keratinocytes, it was shown that Eucalyptus extract did, indeed, up-regulate VEGF gene expression. It also was shown to induce VEGF protein secretion. Additionally, VEGF was discovered to have a role in decreasing desmoplakin gene expression. Therefore, it is likely that VEGF and desmoplakin are involved in the effects of eucalyptus extract on hair. Source: Effects of eucalyptus extract on hair properties and their molecular mechanisms. Hiroyuki Taguchi, Sachie Ueda, Chie Ogawa, Hiroshi Yoshida, Shigeru Moriwaki, Takashi Kitahara, Biological Science Laboratories, KAO Corporation, 2606 Akabane Ichikai Haga Tochigi 321-3497, Japan. 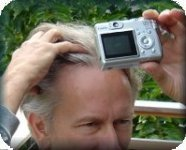 This entry was posted in General, Hair Health on August 14, 2009 by Larry Shapiro.